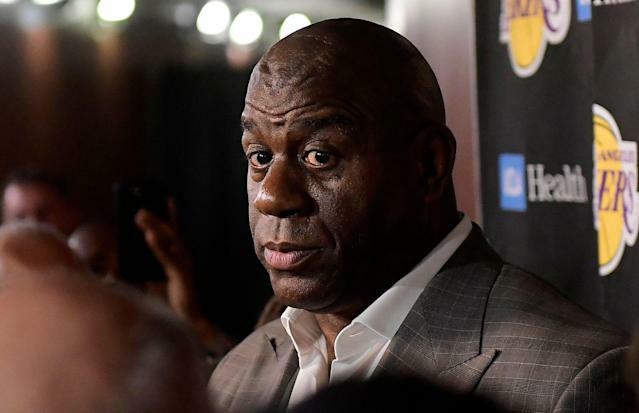 On the precipice of an NBA playoffs that the Los Angeles Lakers will not participate in, team president of basketball operations Magic Johnson stunned the basketball world Tuesday by announcing he’s stepping down. Johnson cited a desire to have more fun as motivation and told reporters he was breaking the news to them before he told owner Jeanie Buss. In addition to surprising Buss, Johnson shocked NBA Twitter, which had plenty to say about his departure — one that arrived on a big night in the NBA that included Dwyane Wade’s final home game in Miami and what looked Dirk Nowitzki’s career finale in Dallas. Magic Johnson just quit the #Lakers like Tom Cruise quit The Firm. Of course NBA media weren’t the only people with reactions to the news. The rest of Twitter also had plenty to say. Magic Johnson stepping down (Rob Pelinka probably leaving soon too) is probably the best thing to happen to the Lakers all season... not even joking. I honestly think that Magic Johnson resigning May be the funniest, most satisfying, most just thing to ever happen.